An ancient Greek scholar, Aristarchus of Samos discovered and perpetrated the first notion that the sun was the center of our solar system 1,700 years before Copernicus was born. Medieval scholars were led to believe the Earth was the center of everything and that the planets, sun and moon circled Earth every day. The Catholic Church—a huge authoritative figure—regarded the Earth-centered universe as God’s plan. This is what geocentric means: the center of it all. Nicolaus Koppernigk was born in Poland in 1473 and grew up in Torun. Nicolaus’s father, also Nicolaus Koppernigk (the elder), was a successful merchant, a trader of copper goods. The town of Torun snaked along the Vistula River in Poland where most citizens spoke German and was populated by 20,000 industrious citizens, which made the area a cultural center and a town with a bustling river trade. Nicolaus had many opportunities to enjoy various cultures, learning from the sailors and merchants in the lively port city. His father died when he was 10 and his uncle Lukasz Watzenrode, an important man and a Catholic bishop in Warmia, raised Nicolaus. Because of his uncle’s standing, Nicolaus received a rigorous education and learned Latin, the language of scholars and the educated. At 19, Nicolaus enrolled in the University of Krakow –the finest institution of its time and the highest academia in all of Eastern Europe. He excelled in mathematics and astronomy. During this time, Nicolaus Latinized his surname name to Copernicus to fit in with this cosmopolitan city. Nicolaus’ thoughts were already turning heavenward and he studied the Alfonsine Tables and the Tables of Directions, both fundamental texts for astronomers. In 1494, Copernicus left Krakow and took up the obligation of church duties bequeathed him. His uncle probably saw it as a way for his nephew to acquire a steady economic future, but soon after, he headed to Italy for a degree in canon law—church law—at the University of Bologna. He arrived at an apt time. The wave of barbarism and raids for land and protectionism had passed and the people looked to the ancients for wisdom and truth once again. The works of ancient thinkers such as Plato, Eudoxus, Aristotle and Ptolemy were being revisited after the difficult Middle Ages, when Europe was rife with rival states’ takeovers and periods of mere survival for peasants, serfs and the uneducated. The Italians especially witnessed a rebirth in classical learning and values along with a renewed curiosity for life, science and ideas that took center stage. Nicolaus was fortunate enough to live during this European Renaissance, where Greek, Roman and Islamic learning texts were becoming available; Gutenberg had invented the printing press in 1445, which forever changed the lives of literate people. Previously, books had been laboriously hand-copied by monks and available to only a few. Now great minds were back to scientific experiments and Renaissance scholars took their place in the universe and discussed humanity’s role in it. Born in 427 BCE, ancient scholar Plato founded the Academy in Athens where scholars came together to study the great queries of life and the universe. Plato’s influential ideas were put into a book called Timaeus. In this book, he argued that an unknown and divine maker must have created the universe’s order. He surmised the universe as they knew it was earth-centered and that heavenly bodies were divine objects. He also believed that eclipses occurred when the Earth blocked the sun’s light from hitting the moon. For centuries, scholars would argue over the fact that planets sped up, slowed down and even occasionally reversed directions in a loop before their usual march from east to west. Eudoxus and Aristotle were students of Plato who further developed Plato’s theory of the universe and planetary motion. Their plan suggested that planets were lined in connected spheres and all turned like a mechanical clock’s movements around a centered Earth. The drawings of the paths were becoming more convoluted. An Egyptian of Greek origin from the second century, Ptolemy had a different description: he said that the motion of heavenly bodies had to be in perfect circles at a constant speed and that Earth was the center of it all. Ptolemy described this phenomenon in an enormous volume—a series of 13 books—called the Almagest. His complicated system concluded that the Sun circled the earth but with speed inconstant. By Copernicus’ time, Ptolemy’s modified description added epicycles—smaller circles that went around a point on a larger circle using midpoint lines called equants and circular paths called deferent. In the late 1490’s, Copernicus befriended a man named Domenico Maria da Novara who had published a book challenging Ptolemy’s authority. He claimed to have discovered that the latitudes of most European cities were actually up one degree and 10 minutes, meaning there was a shift in the tilt of Earth and that it rotated on its own axis. Around 1510, Copernicus developed a different theory. He re-envisioned the cosmos with the sun rather than Earth at the center of the planets. One of Copernicus’ students, Georg Joachim Rheticus of Austria, helped his mentor prepare a long-neglected manuscript with those thoughts in mind. Copernicus brought a new idea to Ptolemy’s plan when he wrote the document, Brief Sketch—The Commentariolus. He wrote, “All spheres surround the Sun as through it were in the middle of all of them, and therefore, the center of the universe is near the Sun. What appear to us as motions of the Sun arise not from its motion but from the motion of the Earth and our sphere, with which we revolve about the Sun like any other planet." As if a magician, he had made Earth a planet and set it spinning. Nicolaus used three instruments to log heaven’s measure: a triquetrum, a quadrant and an armillary sphere. None of these devices contained lenses of any kind. They didn’t sharpen his vision. Similar to surveyor’s tools, they helped him map the stars and trace the path of the moon and planets. A wooden triquetrum could gauge a body’s altitude by slinging a hinged bar until its peepholes framed the planet or star, and then reading its elevation from the calibrated lower scale printed on the wood. His bold plan for astronomical reform went slowly and was put on the back burner of publication for decades. He proceeded cautiously and leaked the idea to fellow mathematicians. All the while, history and warfare again churned around him. He probably would have been burned at the stake should he have brought these ideas forth earlier. “I can readily imagine, Holy Father, that as soon as some people hear that in this volume, which I have written about the revolutions of the spheres of the universe, I ascribe certain motions to the terrestrial globe, they will shout that I must be immediately repudiated together with this belief." Decades later when the first telescope lent credence to Copernicus’ work, the Holy Office of Inquisition condemned his efforts. An Index of Prohibited Books came out in 1616 and Copernicus’ book remained on that list for two hundred years. Bortz, Fred. 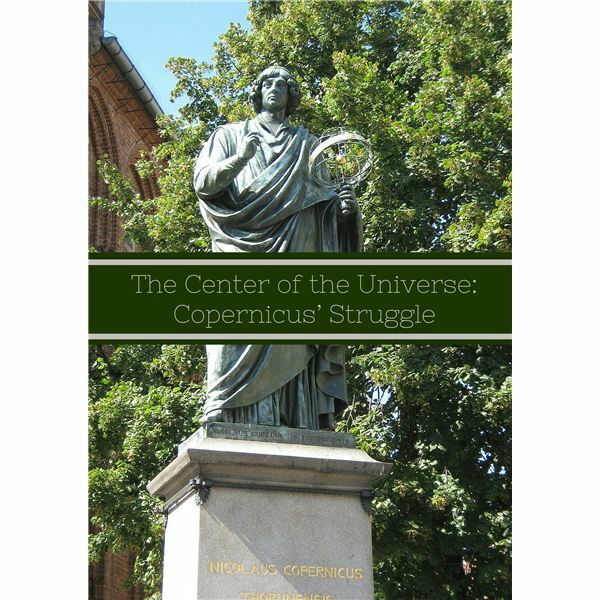 The Sun-Centered Universe and Nicolaus Copernicus. New York: Rosen Publishing Group, Inc., 2014. Book. Sobel, Dava. A More Perfect Heaven. New York: Walker & Company, 2011. Book. Vollman, William T. Uncentering the Earth: Copernicus and The Revolutions of the Heavenly Spheres. New York: W.W. Norton, 2006. Book.